The diatonic harmonica is the most popular harp in North America, but many other types of harps are worth checking out. 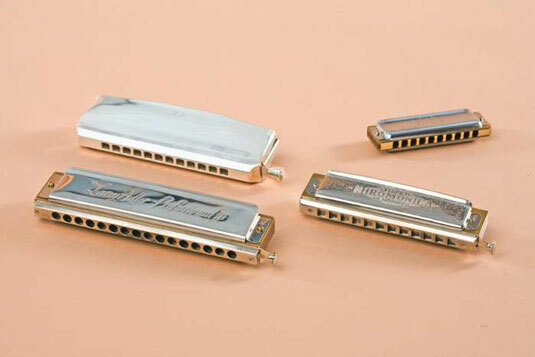 There are three other popular harmonicas that you may want to explore. You may find chromatic, tremolo, and octave harps in stores that have a broad selection of harmonicas, but many stores stick to the most popular models and keys of diatonics, rounded out by one or two chromatics. You may have to go online to find other types (though, depending on where you live, you may find inexpensive Chinese tremolos in variety stores). A chromatic harmonica has a button on the right side. When you press the button, you get a different set of notes tuned one semitone higher than the main key. If you have a chromatic harp in C, you get the key of C♯ when you press the button. The two sets of notes provide you with a complete chromatic scale, allowing you to play any scale in any key. You can get all the notes without needing to bend (though you can still bend notes for expression). Chromatic harmonicas are used for jazz, classical music, movie soundtracks, and occasionally for blues and popular music, but for some reason the chromatic is most popular in Asian countries, where it’s used mainly for classical music. Chromatic harmonicas evolved from the diatonic harmonica, and the two instruments have a lot of similarities. The note layout of the chromatic takes the middle register of the diatonic (Holes 4–7) and repeats it through three octaves. This repetition allows the note layout to stay consistent. In other words, there’s no top-octave shift and no missing notes in the bottom octave. This note layout is called solo tuning. Despite what you may have heard, the chromatic is no harder to play than the diatonic and takes the same amount of wind. And yes, you can bend notes on it. However, the chromatic does require a slightly different approach from the diatonic, but in some ways it’s actually easier to play than the diatonic. Some of the great harmonica music you hear, like most of what Stevie Wonder plays, is played on a chromatic harp. Most good blues harmonica players use a chromatic for some tunes, usually in third position. Most chromatic harmonicas come in the key of C, though you can get them in several other keys. The most popular types are the 12-hole chromatic, with the same three-octave ranges as a diatonic, and the 16-hole chromatic, which has a deep, low octave added. 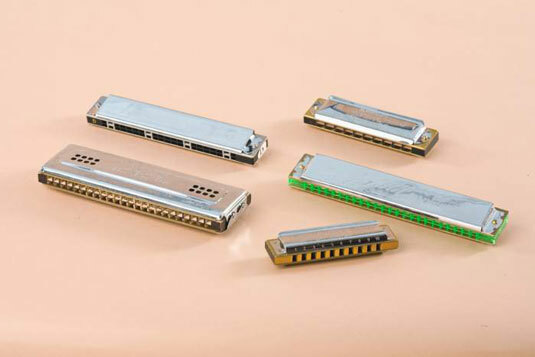 Several major manufacturers make solid, dependable chromatic harmonicas. Among them are Hering, Hohner, Seydel, and Suzuki. Listen here for some third-position blues played on a chromatic harmonica. The most popular type of harmonica worldwide is the tremolo. Inexpensive tremolo harmonicas are easy to find in the United States, even though few people play them here (Mickey Raphael of the Willie Nelson band is a fine exception). However, in many countries, including Canada, China, Ireland, Japan, Mexico, and Scotland, tremolo is a favorite melody instrument for playing folk music. Tremolo harps have two reeds for every note, mounted in two stacked rows of holes. One reed is tuned slightly higher than the other, and the slight difference in pitch causes a quavering sound, or beating, that produces the tremolo sound. Octave harmonicas are double-reeded harps that have two reeds tuned an octave apart. The low reed gives fullness to the tone, while the high reed gives it brightness. Like regular diatonics, tremolo and octave harmonicas come in several different keys, including both major and minor keys. Major manufacturers include Hohner, Huang, Seydel, Suzuki, and Tombo. You can hear sample melodies played on octave and tremolo harmonicas.